Lord of the Rings Swords and Hobbit Movie Swords from the epic works of JRR Tolkien and the award-winning film adaptations by Peter Jackson. Officially licensed swords are available from The Lord of the Rings: The Fellowship of the Ring, The Two Towers and The Return of the King. The Hobbit: The Unexpected Journey, The Desolation of Smaug and Battle of the Five Armies replicas are also available. These authentically detailed movie swords and replicas are made from the actual film props by Weta Workshop of New Zealand. Made by United Cutlery, each item includes display and Certificate of Authenticity. Sting Swords for sale are officially licensed swords from the Lord of the Rings movie. The Sting is the sword of Frodo Baggins and is 20 ½ inches in all. They feature an unsharpened 14 inch 420-stainless steel blade that is engraved with a rune sketch written in the Elvish language. The hardwood handle features a metallic leaf design. The guard and pommel are crafted of solid metal with an antiqued silver finish that is engraved with Elven writing. The Sting Swords include a free wooden wall display plaque with mounting hardware and instructions. They include a Lord of the Rings Certificate of Authenticity. 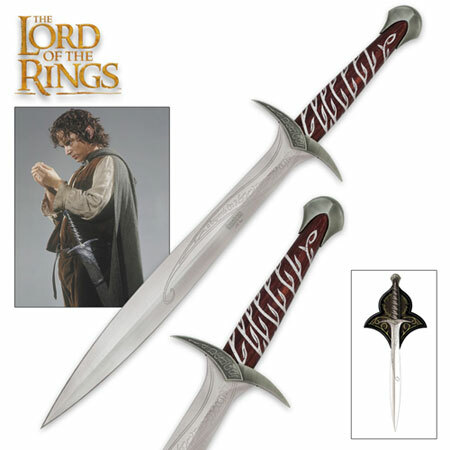 Buy the Sting Sword, the officially licensed Sword of Frodo Baggins for $129.99.